When it comes to grocery shopping, I’m definitely an impulsive buyer. I walk through every aisle, even though I know exactly what I need going in, and always leave with a bag full of ingredients for which I have no true purpose; this purchase was no exception. With my box of Cacao Butter in tow, I began “hitting the books” and trying to find a recipe. When I stumbled upon these raw, vegan almond joy bars, I couldn’t help but squeal with delight — they were exactly the sweet treat that I needed. These are definitely healthier than the variety you would find at the drugstore, but they are so satisfying — I’m totally converted. In a food processor, process all filling ingredients till well combined. It will be a little wet, but they will stick together well once you chill it.. Shape the filling into twelve mini bit size rectangles. Place them on a parchment lined baking pan and refrigerate for 30 minutes. 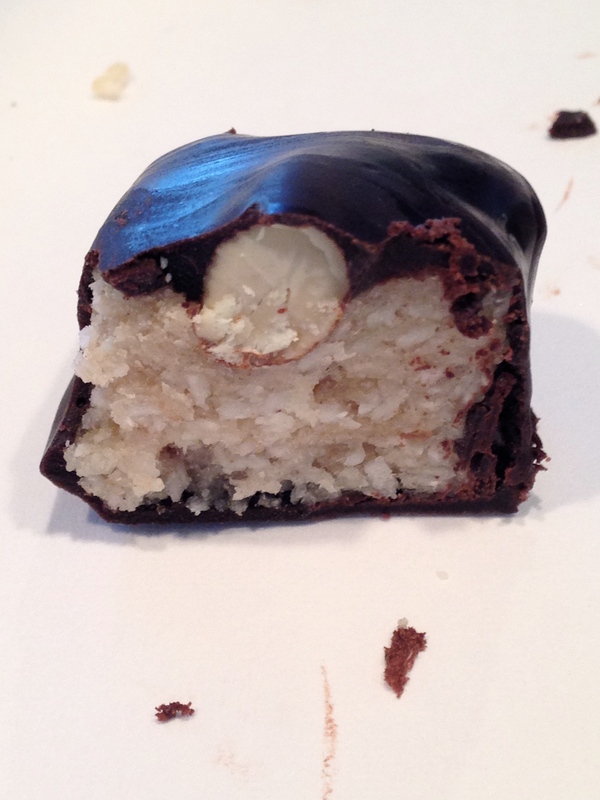 Take each mini coconut bar and dip it into the chocolate coating, quickly placing it back on the parchment. Return them to the fridge for 10-15 minutes, or until one coating has set. Repeat the process again, so that each has a double coat. Return them to the fridge for another 15 minutes, or more to let them set. When ready to serve, let them sit outside the fridge for about 10-15 minutes. Hi Monique! I purchased my cacao butter and powder at Plum Market (local store), but am almost certain they would have it at Whole Foods, as well. I’m planning to make these for one of our Passover desserts, so I agree that they would go well with some brisket 🙂 . Hope you’re doing well! A love of Almond Joys clearly runs in the family. My FB post about Grandpa/Papa’s AJ habit speaks to that. He would surely have loved your version!